For most people, bread is an essential part of breakfast. Some even eat it for desserts topped with their favorite fruits and cream. Regardless if you know how to bake your bread at your house or not, having the best bread slicers can be handy. Bread knife won’t be able to provide your desired cut anytime you want. To avoid unevenly and out of shape bread cuts, we have searched the market and created a list of the top ten best bread slicers for you. The following are the bread slicers that stands out because of their advanced features, system, and convenience. The bread pal bread slicer is a perfect addition to your kitchen. It features an original foldable bread slicer that requires no set-up at all. This product is made of USA maple, birch and hardwood face with no bamboo and no splinters that can last for a long time. Since the cutting area is prone to wear and tear, you can replace that part later on. It also helps to keep your food safe and clean to eat. This bread slicer is ideal for beginners thanks to its easy set-up. The self-locking design requires little to no maintenance. If you are still learning how to bake homemade bread, this bread slicer can be your partner. It’s also foolproof slicing and cuts round, regularly-shaped loaves for you and your family. Next, we have the bread pal slicer with folding design for easy storage and convenience. It is made of American hardwood faced materials and food-safe cutting surface. With proper care and maintenance, this product can last for a long time. 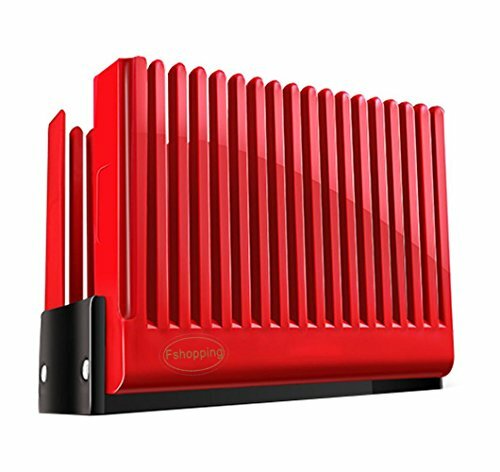 Its solid locking design makes it perfect for beginners as you can set it up in just three seconds. No assembly is required at all! 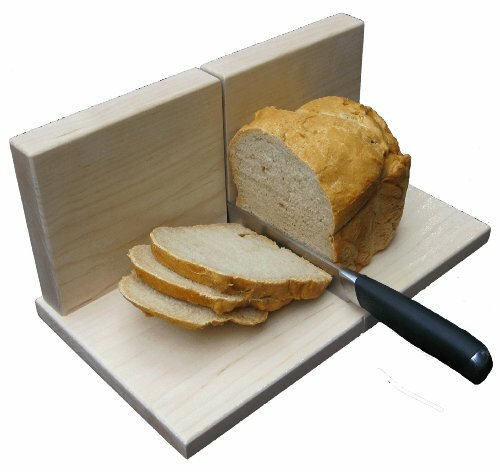 Compared to the previous product we’ve reviewed; this item has a wider cutting surface that allows you to cut wider loaves. In that way, you are not limited to small bread loaves only. It’s easy to use and requires little to no maintenance. Now you can experiment baking pieces of bread in your house and not worry when it comes to cutting! 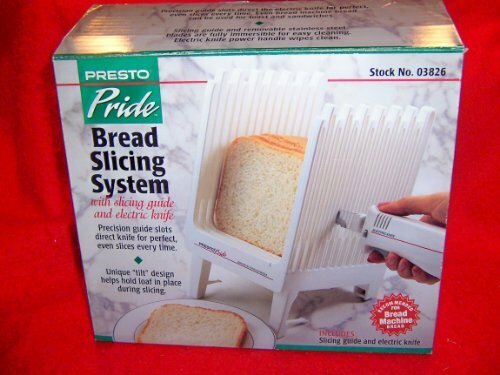 The Presto pride bread slicing system is your classic slicer that’s easy to use. The package comes with a slicing knife guide and an electric knife. Its precision guide knife for perfect and even slices every time you prepare bread for your family. Notice the unique “tilt” design that holds the load in place when you are slicing compared to other items we’ve reviewed so far. We also like how easy it is to use this product. There is no assembly required. You can start using it straight out from the box. With its electric knife and unique tilt design, slicing loaves have never been easier for you. Have fun in the kitchen baking bread or buying unsliced loaves so you can customize the desired cut of your bread that you serve in your family. The classic maple bread slicer from bread slicer depot is constructed with stainless steel screws and hard maple to serve you in the kitchen for years to come. The rubber feet grip your countertop and avoid slippage. It does not consume much space as you can store it easily and also allows you to stack some items onto it. One good thing about this bread slicer is it allows you to stack any size of loaf, regardless if it’s handmade or bread maker sized. This heavy-duty slicer guide is perfect for rugged use in the kitchen. Slicing pieces of bread have never been enjoyable with this product. It allows you to gain full control when it comes to the sizes and cuts of your loaves. 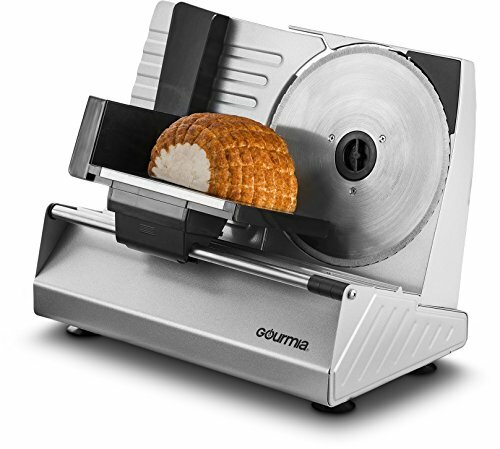 If you are willing to spend some extra dollars, you might want to invest in this advanced bread slicer by Gourmia. This heavy-duty upright bread slicer is designed with a spacious sliding food carriage, a prime coated steel, and die-cast aluminum housing. Rest assured that it can last for a long time with proper care and maintenance. You can gain full control when slicing your bread using this product, adjusting the thickness handle from super thin to approximately ¾” thick allows you to explore a variety of sliced roasts and bread delicacies. Notice that that blade and food folder are removable for safe and hassle-free cleaning. The suction grip bottom ensures that the product will not slip from your countertop while you are using it. This product is ETL-certified that assures you that you’re using a safe, efficient, and high-quality appliance in your kitchen. 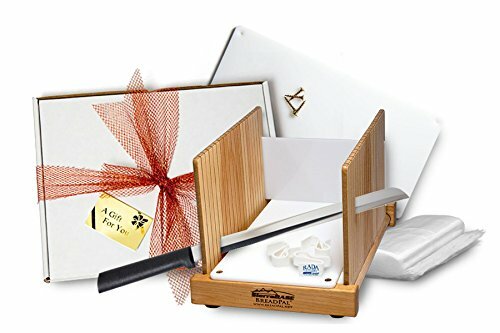 Next, we have the DBTech bamboo wood compact foldable bread slicer for customers on a tight budget. The three groove sizes allow you to choose three difference slices, depending on what you are planning to prepare. 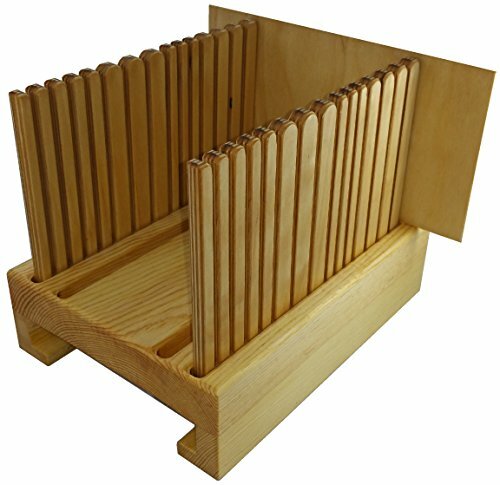 It’s folding design does not consume much space and will enable you to store the bread slicer when not in use. This slicer is made of 100% natural bamboo, rest assured that it’s pollution-free and ideal for heavy-duty use. If you are looking for a slicer that you can use in your bakery, homemade bread, or if you occasionally bake loaf cakes, this is the perfect product for you. It’s efficient without breaking your bank. This slicer is easy to use; even beginners will enjoy this product. Not to mention that it also looks great in both modern and rustic kitchens. If you liked the previous product, you would also like this bamboo bread slicer from Bambusi. For cutting your loaves evenly, this is the ideal product for you. This bread slicer makes slicing loaves uniformly a lot easier. You can use a ten-inch bread knife for even slices. The slides are grooved that will serve as your knife’s guide in cutting. Now you can choose among four slice thickness depending on what you are planning to prepare. This bread slicer also holds steady the loaf. Whether you are slicing homemade bread, French bread, custom-style baked bread, baguette, and many more, rest assured that it will stay put on your kitchen countertop. It also keeps your fingers away to avoid incidents in the kitchen. We like how this item reduces crumbs and mess, making it easier for you to clean up after using the product. It comes with a crumb catcher tray on the base. After using the product, you can fold it flat and store it away to keep your kitchen spacious and clean. Another bread slicer that is made of wood is the better bread slicer from the Black Hills by Design. This new and improved bread slicer has rounded tops, making it easier for you to insert the knife when cutting bread. It also has a “backstop” that keeps the bread in place while you’re using the product. Its enclosed ends will prevent the side panel from slipping. You can also cut tall loaves thanks to its six-inch high side panels. You can stow the side panels and backstop under the slicer when you are not using it to save some space. The unit balances on sides or ends for storage convenience. We also like how this product prevents your knife from dulling even if you continuously use it every day. Both durable and beautiful, this bread slicer can last for a long time with proper care and maintenance. It’s also a great option if you are still a beginner who don’t want complex systems. For those kitchen lovers who have limited space in their working area, check out this Fshopping foldable bread slicer. It’s specially designed to slice bread, ham, and cheese quickly and evenly. This bread slicing guide is foldable and easy to store, allowing you to save space when you’re not using the product. Because of its quality plastic material, you can clean the product using damp cloth or water and never worry about getting musty if you tend to compare it to bread slicers made of wood. 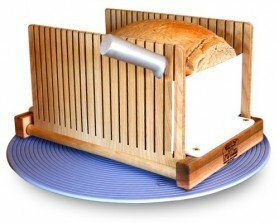 This bread slicer can also cut taller loaves, giving you a wide variety of choices in the kitchen. It’s easy to use and maintain. The tines are more elastic, reducing the risk of breaking in case of the wrong operation. Tines is designed with a little radian in line to clamp the bread effectively. 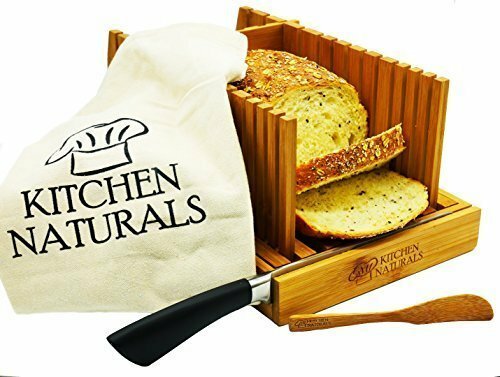 Lastly, we have another bamboo bread slicer from Kitchen Naturals. 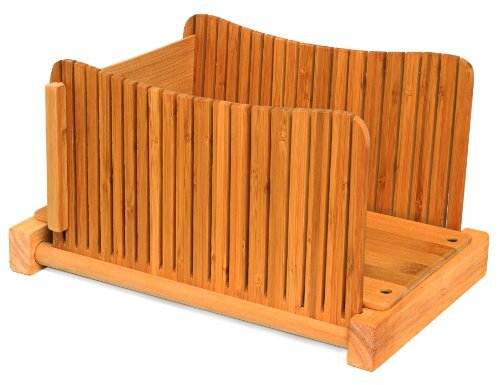 It is made of 100% naturally antimicrobial bamboo that makes it a safe and durable product. You can choose from different sizes in cutting your loaves. This product offers premium features such as convenient knife holder and crumb catcher for easy clean-up afterward. Thanks to its lightweight and folding design, you can store it easily inside your cupboard when not in use. It’s the perfect bread slicer for beginners because it’s easy to use and requires little to no maintenance. 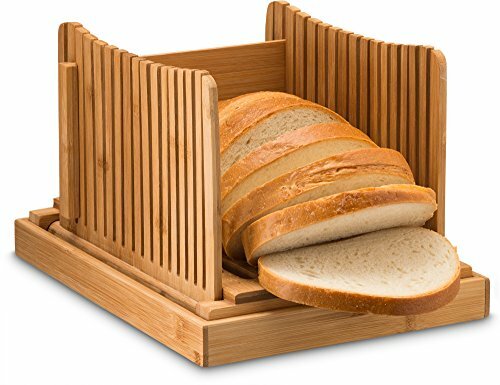 Now you can serve your family any bread delicacies of your choice thanks to this bamboo bread slicer! Bread slicers have offered convenience to mankind since time immemorial. And every kitchen features one, especially if you are running a bakery or loves to eat bread in your household. In buying the right bread slicer to suit your needs, we understand that there are hundreds of choices in the market. Below is an expert buying guide to help you make the right decision along with a list of the best bread slicers available in the market today. What is a Bread Slicer? The bread slicer is a piece of kitchen equipment designed to offer convenience in slicing bread, compared to when using your traditional knife. Bread slicers can generate uniform and even slices of your favorite bread. It saves you time. Using a bread slicer can help you save your time, instead of using a manual knife to cut the bread. This is a beneficial kitchen tool if you are a busy professional, living alone, and have to cook your food with a short amount of time. Ideal for bread makers. If your hobby involves making homemade bread, then you must invest in a bread slicer. Before presenting to your guests your bread, you might want to ensure that it is sliced in uniform and even loaves of bread. Customize the slice according to your liking. Thankfully, some high-end models of bread slicers nowadays will allow you to customize the slab according to your liking. Whether you want it thick or thin, having a bread slicer by your side can solve your little problem. An economical choice. Investing in a bread slicer is an economical choice. Aside from the fact that it does not consume any electricity when used, it also takes a little amount of space in your kitchen. Also, bread slicers are sold at a reasonable price, so you don’t need to worry even if you’re running short on budget. First things first, you might want to ensure that you’re invested in a bread slicer that can last for a long time. Therefore, you should opt for models that are made of metals, if not solid wood as your new kitchen tool. In that way, it can withstand the abuse of everyday use and serve you for years to come. As much as possible, you should opt for a bread slicer with folding design. In that way, you’ll be able to store it away when not in use, saving some space in your kitchen. Bread slicers with foldable designs make it easy to carry around anywhere you want to go. Your primary goal is to have even and uniformly sliced bread. So don’t make it complicated. Opt for a bread slicer that you can use without the help of a manual. Bread slicers are meant to be used by anyone. Therefore, you should opt for a model that you can get you started with bread slicing anywhere and anytime you want. You might want to invest in a bread slicer that has excellent stability. A wobbly bread slicer, when in use, can be very dangerous. You might accidentally cut your fingers if your bread slicer doesn’t stay in place during the operation. Take a look at the base of the bread slicer. It should be made of solid material that can hold the weight of your hands and of the bread you are planning to slice. Your bread slicer should require little to no maintenance for your utmost convenience. Some models have detachable parts that allow the user to wash when necessary easily. It is best that you opt for maintenance-free bread slicers that you can benefit from in the long run. Lastly, you should consider the assembly and installation of the product. As much as possible, you should buy bread slicers that are easy to assemble and install in your kitchen. Some models are delivered pre-assembled, while some require no assembly at all. Installation of the bread slicer in your kitchen should not be time-consuming and complicated.